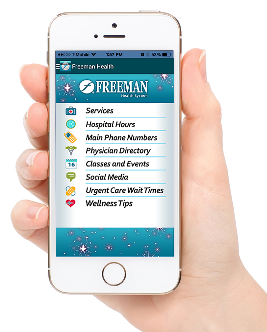 RALEIGH, NC, November 18, 2014 – MobileSmith is pleased to announce the release of Freeman Everywhere hospital mobile app, created and published by its customer Freeman Health System using the MobileSmith mobile app development platform, without any coding. Freeman is a 485-bed, three-hospital system providing comprehensive healthcare and behavioral health services to more than 450,000 patients across Missouri, Arkansas, Oklahoma, and Kansas. To engage patients on their mobile devices, Freeman decided to create a native mobile app for iOS and Android smartphones, packed with useful features such as physician directory and streaming ER and Urgent Care wait times. Locally owned, not-for-profit and nationally recognized, Freeman Health System includes Freeman Hospital West, Freeman Hospital East, Freeman Neosho Hospital and Ozark Center – the area’s largest provider of behavioral health services – as well as two urgent care clinics, dozens of physician clinics and a variety of specialty services. Recognized for medical excellence and safety in 90 categories by CareChex®, a quality rating system that helps consumers evaluate healthcare providers, Freeman provides cancer care, heart and vascular care, neurology and neurosurgery, orthopaedics, children’s services, and women’s services and has more than 300 physicians on staff. Additionally, Freeman is the only Children’s Miracle Network Hospital in a 70-mile radius. For more information, visit freemanhealth.com or facebook.com/freemanhealthsystem or follow Freeman President and Chief Executive Officer Paula Baker at twitter.com/freemanceo.